The Zx1 is designed for adventure. Its rubberized doors and stainless steal panel give strength protection to the body as well as svelte looks for this pocket video camera. It is resistant to rain, snow, sand and dirt but not waterproof nor safe to operate in extreme cold condition. It is tough but not super-tough. The Zx1 is certified to be at IP43 in protection rating. 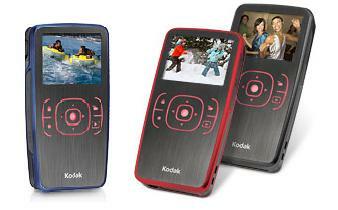 In terms of video quality, Kodak Zx1 enables video to be captured at 720p HD resolution. You can choose to record the video at HD 60 fps, HD 30 fps or VGA quality. Another great advantage of the Zx1 is it is able to produce great video whether in bright or low light condition. However, there is no image stabilization feature on the Zx1. This is a bit of a disappointment for a video camera associated with “adventure”. The recorded video can be viewed at its vibrant 2.0 inch LCD screen at normal view, slow motion playback, fast forward and rewind or frame by frame. With the included HDMI cable, your can experience your videos on an HDTV. You also can share your video with friends by uploading it on YouTube using the built-in software and USB cable quickly and easily. The built-in software will be automatically installed into your PC once it is connected with the Zx1. The software has editing features that let you edit, trim, splice and adjust your videos. This software only supported Windows but not Mac. Kodak Zx1 is available at about $150.00.